(TibetanReview.net, Jul29, 2016) – Chinese troops in occupied Tibet are reported to have become more active across the Chamoli district of India’s Uttarakhand state recently, including with at least one incident of transgression both by land and air. Both New Delhi and the state’s chief minister Mr Harish Rawat have expressed concern but added there was no cause for alarm. Reports Jul 27 and 28 cited Indian official sources as saying Chinese troops transgressed the border on land and by air in the district’s Barahoti area on Jul 19, when its men stationed themselves in the demilitarised zone and its helicopters flew in the Indian air space for over five minutes. The incident was reported to have prompted India’s security establishment to review security along the 350-kilometres border Uttarakhand shares with occupied Tibet. According to the PTI news service Jul 27, the Chinese People’s Liberation Army (PLA) troops were seen in the area when state government officials accompanied by ITBP (Indo-Tibet Border Police) personnel in civilian dress visited the Barahoti ground. The PLA troops sent back the Indian civilian team, claiming that the territory was theirs, calling it ‘Wu-Je’. This was followed by the arrival of a Chinese helicopter which hovered over the ground for nearly five minutes before going back, apparently after taking aerial photographs. To avoid further confrontation, the officials returned and informed personnel at the ITBP post about the incursion by the Chinese side, reported newindianexpress.com Jul 28. However, timesofindia.indiatimes.com Jul 28 cited its sources as saying the “transgressing” Chinese troops, numbering 9-10 PLA soldiers went back to their territory after some heated arguments during the incident when a team led by the Chamoli district magistrate and others including officials from ITBP first spotted them during a survey of the Barahoti ground. This report also cited a source in the Army unit as saying the Chinese soldiers were spotted by the district team inside a “shed built by them”. The border between Chinese ruled Tibet and India, or even the line of actual control (LAC), has continued to remain undefined due to lack of cooperation from China, resulting in frequent incidents of intrusion. “It was agreed with China that we will set up a group to clarify the LAC. And we have been asking those groups to complete their exercise, but the Chinese have not been cooperating,” ANI Jul 27 quoted India’s former union home secretary and Bharatiya Janata Party (BJP) MP Mr RK Singh as saying. 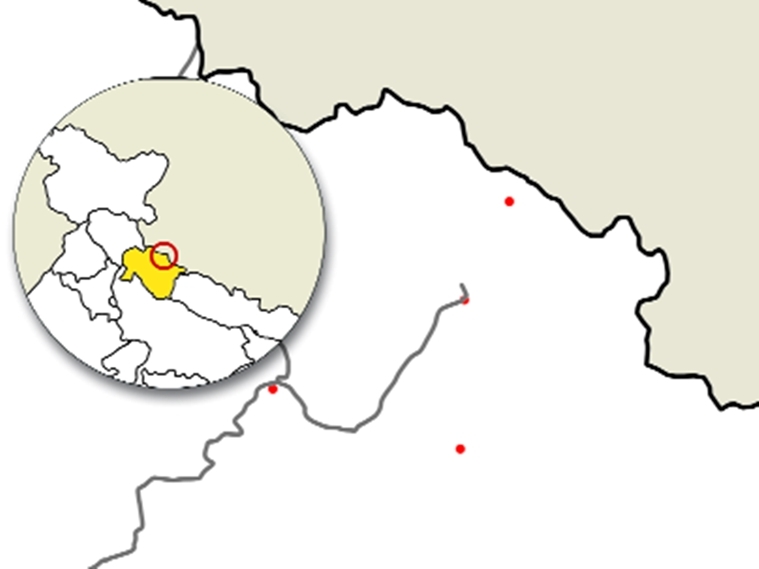 In the case of the Barahoti ground, the PTI report said the 80 square kilometre ground had been agreed by the two countries to be a disputed part since 1957 and was to be sorted out at the negotiating table by the two sides. Over the past few years, Chinese troops have been spotted in the area and even air violations have taken place in this area, it cited sources as saying. The report further said that on Apr 19, 1958, the Chinese side had sent a delegation for negotiations with their Indian counterparts and both had agreed not to send troops into the area but had avoided a discussion on final settlement of the Barahoti ground. In the last previously reported Chinese incursion in the state, the word ‘China’ was inscribed on rocks near Mana Pass in Chamoli district, the report said.